"You know what they say: that nobody's ever seen a cat skeleton in a tree." Forest was in dire straits. The handsome white tom of undetermined age had been chased, most likely by a dog, forty-five feet up a dead cherry tree. Given that he had been marooned there for somewhere between one and two weeks without either food or water his strength sans doute was rapidly ebbing and he surely would not have been able to have held on for much longer. By that time it is even doubtful that he still possessed the physical reserves that he would have required in order to have inched his way back down the tree even if he had had the savior-faire to have negotiated such a delicate maneuver. As if all of that were not daunting enough, a thunderstorm was fast approaching. Luckily for him, his desperate plight belatedly came to the attention of an unidentified Good Samaritan of North Beaver Township, seventy-nine kilometers northwest of Pittsburgh and thirty-nine kilometers southeast of Youngstown, on March 30th who either walked or drove to the North Beaver Township Volunteer Fire Department at 969 Mount Jackson Road in neighboring New Castle in order to procure assistance for him. Assistant Fire Chief Chris Snedaker and Lieutenant Tyler Claypool then immediately drove almost two kilometers to Reed Road alongside Hickory Creek where they propped a twenty-five-foot ladder against the tree and from there attempted to coax Forest into a plastic milk crate that they were dangling in front of him on a pike pole. He was too frightened to have availed himself of their entreaties, however, and they soon were forced to abandon the rescue effort due to circumstances beyond their control. "We tried to get him down," Snedaker later told the New Castle News on April 8th. (See "Cat Saved by Firefighters in Need of Home.") "There was a lot of lightning by that time. We had to give up." Normally, that would have been the end of the matter and Forest's fate would have been left to the gods to decide. Claypool is one firefighter who takes his responsibilities seriously, however, and he returned to the tree once the storm had passed. Mercifully, Forest somehow had managed to survive all the wind, rain, thunder, and lightning without being either electrocuted or hurled to his death below and as a consequence he was still precariously clinging to that dead tree limb. Far from spending the interlude at the fire station playing cards and schmoozing with the other volunteers, Claypool had been busily improvising another rescue plan. This time around he accordingly brought with him a golf ball that he had drilled a small hole through the center and it was through that aperture he painstakingly threaded fishing tackle. He next threw the line over a branch near Forest. He then attached a milk crate to the line and hoisted it up the tree to Forest. Apparently having had more than enough of both nasty thunderstorms and going without food and water, he willingly jumped into the crate without having to be coaxed and promptly was lowered to terra firma. Other than being hungry, thirsty, and soaked to the bone, Forest came away from his long and trying ordeal in, apparently, excellent shape. Claypool soon remedied his latter condition by dropping him off at the fire station so that he could dry out while he continued on to a nearby Walmart in order to purchase some food, treats, litter, and other feline accessories for him. "I thought it (firemen rescuing cats from trees) was a myth, but I guess it happens," Snedaker later opined to the New Castle News. The reason that he would think such a thing is that fire departments all across the United States almost universally refuse to rescue cats that have become stranded in trees, on electrical lines, and at other high elevations. For example on February 9, 2007, firemen in the Louisville suburb of New Albany, Indiana, categorically refused to save a cat named Stinky that had been trapped on a roof for three days. The same deplorable situation prevailed at the public library in Augusta, Georgia, on February 28, 2008 when a gray and white cat became stuck up a tree. 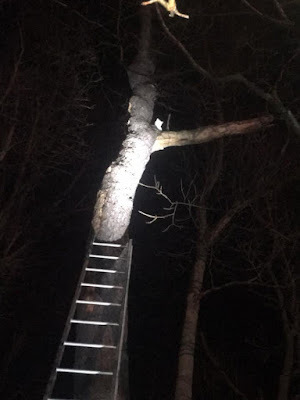 The local fire department at first demurred by claiming that it was scared to death of cats and even when it finally did show up it brought along with it a ladder that was way too short in order to do the job. Not contented with displaying his abysmal ignorance of the number of cats that are chased up trees every day by vicious dogs, Snedaker had at least one more bit of sottise left in his arsenal of mindless blatherings and he wasted no time in putting it to good use. "You know what they say: that nobody's ever seen a cat skeleton in a tree," he sneered to the New Castle News. Furthermore, it is not merely the lives of cats that firefighters are endangering when they adamantly refuse to do their duty but those of humans as well. For instance on February 27, 2008, twenty-seven-year-old Scott Buehler of Orange, California, plunged forty feet to his death while attempting to save the life of a cat that had been stranded for two days up a fifty-foot Cypress. In the immediate aftermath of this totally preventable tragedy, Captain Ian McDonald of the Orange Fire Department was spouting the same self-serving nonsense as Snedaker. "When cats get hungry, they typically come back down," he gassed to The Orange County Register of Anaheim on February 28, 2008. (See "Man Who Died Trying to Help Cat Was Experienced Climber.") "Also, laddering a tree has a level of risk involved. Knowing that the cat will come down, we don't take unnecessary risks." That is pure baloney in that not only are all cats different but circumstances vary tremendously as well. Accordingly, neither McDonald nor any other fireman can conceivably know beforehand if a cat is going to be able to get safely down from a height. What he, Snedaker, and others are really saying is that the lives of cats are of such little consequence that they are unworthy of being saved. Moreover, it is pure balderdash for any of them to claim that rescuing a cat from a tree is more dangerous than either entering burning buildings or dealing with gas and other types of explosions. Where Are You Now, Forest? 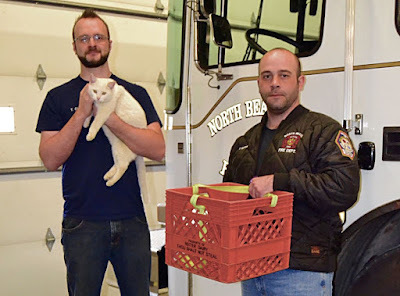 Plus, numerous fire departments recently have purchased pet oxygen masks and that development already has saved the lives of innumerable cats.Their surprising willingness to come to the aid of feline fire victims makes their intransigence in regard to those that become stranded in trees all the more difficult to justify. 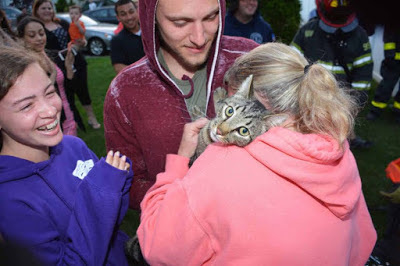 Shortly before that on May 10, 2015, firefighter Danny Leboff of Oceanside, a hamlet within the town of Hempstead on Long Island and located forty-eight kilometers east of Manhattan, climbed down into a ten-foot-deep dry well in order to save the life of Sandy D. Valenti's cat, Roscoe. He had missing for two weeks and is presumed to have spent that entire period trapped in the well. Despite the stellar work of Claypool and others, it is precisely the reprehensible attitude that they have against rescuing cats stranded in trees and on power lines that is the number one black mark against American firefighters. Unless they can somehow be prevailed upon to amend their thinking on this issue, tree surgeons, utility companies, and selfless acts on the part of private citizens are destined to remain as the only viable alternatives that owners and those who care about cats have when it comes to rescuing them. As for Forest, it is a mystery as to what has become of him. Claypool and his fellow firefighters told the New Castle News that they would like to keep him but were unable to do so because not only is the fire station located on a busy highway but it is frequently rented out for community events. 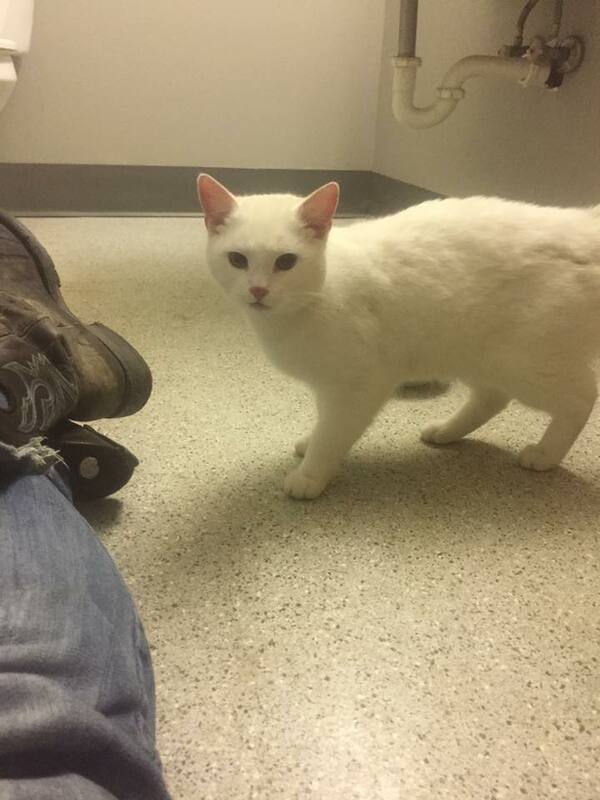 As a consequence, they claimed to be in the process of searching for a new home for him. Earlier on April 3rd, the firefighters posted a similar notice on the station's Facebook page but, inexplicably, there have not been any subsequent references to him on it or in the press. If Forest were still alive, in good health, and residing in a new home, it stands to reason that they would want the world to share in that good news. Almost anything is possible with cats but the firemen's reticence regarding Forest is, at the very least, a disturbing and ominous development. Otherwise, this story would have had an unqualified happy ending. Photos: Facebook (Forest up a tree and by himself), Mary Grzebieniak of the New Castle News (Forest with Claypool and Snedaker), and Bill Bennett of the New York Post (Leboff handing over Roscoe to Valenti).